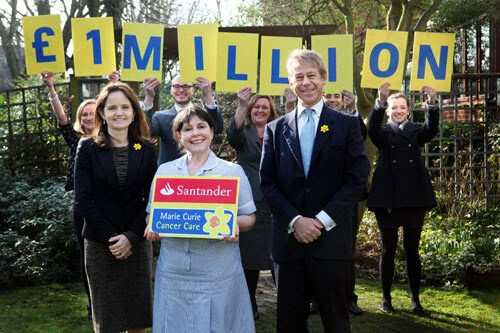 Santander staff are celebrating today with the announcement that they have raised an amazing £1 million for their 2012 charity partner, Marie Curie Cancer Care. This significant achievement is the result of just one year of fundraising by staff and customers across the UK. It signals the end of their 2012 charity of the year partnership, which has proved to be Santander’s most successful to date – doubling the amount they first set out to raise for Marie Curie. The money raised by Santander will fund 43,000 hours of Marie Curie home nursing care, whilst £140,000 of the total supported the development of the charity’s new hospice in the West Midlands. Over the last year the company’s employees have baked, collected, quizzed, hiked and relayed their way to the record-breaking figure. Fundraising highlights saw staff raise £200,000 by trekking the Great Wall of China, as well as It’s A Knockout tournaments and the Santander Flame Relay [an 18-leg nationwide course], which raised £60,000 each.